In my last two posts, I have been discussing my new book, Kokoro Yoga, and the program Catherine Divine and I are launching by the same name. One of the key strategies of Kokoro yoga is the integration of physical, mental, emotional, intuitional and spiritual training. Every strategy has a series of tactics used to accomplish success, and one of my favorite tactics to integrate is the morning ritual. As an active Navy SEAL, my daily battle rhythm was dictated by the mission my team was preparing for or conducting. No matter the mission, the one thing that was always a part of our morning routine was team physical training or PT. That training, an invigorating (to say the least!) combination of full-body calisthenics, running, swimming and an obstacle course, provided a power-packed morning ritual for myself and my team as a whole. 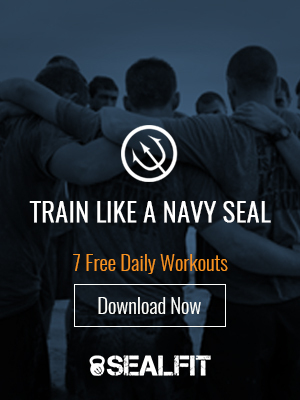 Starting my day with a highly-charged, functional fitness workout, just like in the SEALs, is a habitual routine that I have carried into my professional life after military service. But the way I do that routine now and how I teach it in Kokoro Yoga is somewhat uncommon. My experience in the SEALs taught me that how you train is equally important as to whether you actually train. Many people struggle daily with “whether” to train. As a SEAL I have that covered—it’s on automatic pilot. Rather, my team and I now spend considerable time experimenting with “how” to train, to use that time not only to strengthen the body but also strengthen the mind and emotional resiliency—all within one session. I would characterize morning ritual as “integrated warrior development.” Though it changes a bit daily, for variety and to meet my objectives for the day, the basic building blocks remain the same. Next, I review my personal ethos to ground my inner domain in the important things, and box breathe for 5 to 20 minutes (a core practice I teach my students). To cap off this stage of the morning routine, I visualize my day by “dirt diving” it to set things on the right path. I also picture a “future version” of myself to sow the SEALFIT goal-actualization process. Finally,I have a cup of coffee with coconut oil and butter, and head into my workplace where I crank out my 90-minute SEALFIT Operator Workout of the Day (OPWOD) either alone or with my teammates. This routine may sound extensive to you, but it has led me to an incredible level of integrative health and functional fitness at 52 where I can routinely outperform men half my age. Another exciting outcome is that the powerful time I spend each morning working on my “inner domain” has resulted in much greater success in the “outer world.” As a result, over the past few years, I have written several best-selling books, built six multi-million dollar businesses and am fully present with my thriving family. In fact, this ritual of Kokoro Yoga, a program we are launching soon through Unbeatable Mind, has actually saved me enormous time and energy by providing me the clarity and confidence to say no to the wrong things in service to the bigger yes! It has also delivered astonishing levels of focus and energy while ensuring that I am growing physically, mentally, emotionally and spiritually every day. And to that, as we used to say in the SEALs, I give a big Hooyah! P.S. My team and I are kicking off a FREE Community Wide 30 Day Kokoro Yoga Crucible Challenge on April 25th. Stay tuned for details, and in the meantime, Click HERE to pre-order my upcoming Kokoro Yoga book BEFORE April 12th and get TWO awesome gifts instantly, valued at $49….This will help you get prepared for the challenge! Great post sir! I am excited to learn more, and integrate Kokoro Yoga into my daily practice. I am building a new gym community and hope to make daily visualizatiion and Kokoro Yoga a part of our total mind body programming. * The “15min to start your day” are the 5 bullet points leading up to, but not including the workout at the office, correct?